Battle Creek is unequivocally the "Cereal City." But relations between the city and Kellogg Co. -- its largest employer -- haven’t always been as sweet as a bowl of Froot Loops. In the early 1980s, Kellogg threatened to pack up its cereal boxes and leave town unless the city and Battle Creek Township merged. didn’t merge. Kellogg said the two units needed to combine to form a more cost-efficient local government. The company said being located in a single community of 55,000 residents, rather than a city of 35,000 people and an adjoining township of 20,000, would help Kellogg and Battle Creek attract new workers. Voters approved the merger in 1982 after a divisive campaign. Opponents of the measure called it "corporate blackmail" by a company that was practically synonymous with Battle Creek since 1906. For decades, the company’s marketing slogan was "Kellogg’s of Battle Creek." But the city-township merger, as painful as it was at the time, has paid off handsomely in the form of new jobs and investment by Kellogg. "Kellogg gave the community a choice. It said it could no longer be competitive under the current structure. The community answered the call," said Jim Hettinger, who was president, at the time, of Battle Creek Unlimited, a local economic development agency. At the time of the merger election, Kellogg had about 700 employees in Battle Creek. Today it employs 2,000 people, many of whom work at the company’s downtown headquarters, which opened in 1986. 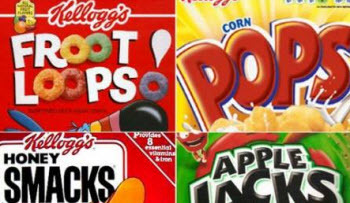 In 1997, Kellogg opened its $75 million W.K. Kellogg Institute for Food and Nutrition Research, which has since undergone a $54 million expansion. Kellogg also purchased Chicago-based Keebler Foods Co. in 2001 for $4.56 billion. In February, Kellogg announced it was purchasing Procter & Gamble’s Pringle’s business for $2.7 billion. "They’ve brought all the Keebler people here. Hopefully they’ll do the same with the Pringle’s people," said Hettinger, who’s a senior adviser to Battle Creek Unlimited. Battle Creek’s cereal heritage, which also includes Post Foods and Ralston Foods, has helped the city transform itself into a food science and research center. The Global Food Protection Institute was created in 2009 with partial funding from the Kellogg Foundation. It operates a training institute for food inspectors from around the world and runs a business incubator for start-up companies in the areas of public health and food safety. "We have a global food processing system," Hettinger said. "It’s wise to assure a safe food supply." Much of this new activity is taking place in the once moribund downtown area, which is undergoing a planned, long-term $85 million restoration. Kellogg Co. and the Kellogg Foundation are financing much of the revitalization effort, which is restoring some snap, crackle and pop to the city’s image. Heads up bro, Marshall is the county seat, not Battle Creek. Thanks for the catch. We will correct. Derek Melot, senior editor. Too bad the Kellogg's corporate influence was not duplicated elsewhere. The 60 or so year history of bickering townships and cities left us with poorly defined urban settlement areas and the most expensive lay outs for public services. The well-defined town and country atmosphere, however governed, is a magnet for economic development and a higher quality of life--Michigan could have done a little better competing in the global economy with character rich places and adquately funded local services. Thanks to Governor Snyder for tie-barring revenue sharing to more local cooperation. Now off to Kroger's for their cod on a bike on the most convoluted route imaginable to get to this commercial strip development with my bike and body in tact. As significant as the "Pure Michigan" campaign is to Michigan, it's obvious purpose is to bring tourism dollars into the state. There is nothing wrong with that. But there are other means of promoting our state. Although no longer used, one effective statement was the cereal box slogan, "Kellogg's of Battle Creek". No one forced Kellogg's to do it and the slogan didn't bring in any extra sales, it didn't cost anything but its subtle promotion of Michigan was worthy of the best in advertising campaigns. Put on millions of boxes of cereal, it said that Kellogg's is a Michigan company and proud of it - proud of Battle Creek, proud of Michigan and proud of its employees. We need more of that. We need Kellogg's to bring back that slogan and we need other Michigan companies to show some pride in their home state as Chrysler has done with their "Imported from Detroit" ad campaign. For too long, Michigan has passively allowed the national media to take cheap shots at everything from our auto industry to our weather. It's time we fought back. In 1982, I had the privilege of being involved in this successful merger of the city and township of Battle Creek. There were several reasons for my interest, some personal and mostly because I felt it was the right thing for the community. Working with the "city fathers", Kellogg's and the community was one of my best experiences. At that time, I thought perhaps the local people did not really realize how fortunate they were to have a corporate company in their midst that not only cared about their company but also the community. Looking at these pictures, it seems to me the community and Kellogg's still care. I would like to see more pictures of Kellogg Park and the river. I know expanding that waterfront was always a dream but I have never seen resulting pictures.